Increasingly, water is a precious resource, not to be wasted. Water storage by use of dams or ponds requires the very best liner materials to prevent leakage from the reservoir into the ground. Fortunately, today’s geosynthetic and geomembrane materials offer long life for a multitude of different applications. 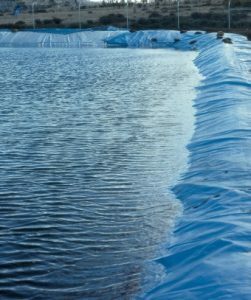 High-quality dam liners made from reinforced polyethylene can prevent seepage for more than 20 years, and even longer if buried under a layer of material such as sand to protect from UV degradation. Most commonly found in agricultural or rural settings, one of the easiest ways to store or retain water is using earthmoving equipment to hollow out a basin in the ground, smoothing the surface to the desired shape, free of jagged or abrasive materials – sometimes using a bed of sand for example – and then lining this dam with the right fabric. Once you’ve made your retention pond you don’t want to have to go back every few years and re-line it, and you don’t want to lose water to seepage while you’re finding out the material is compromised. For your dam liner material, you want high resistance to abrasion or puncturing, and high UV resistance. You want it to fit seamlessly the size of your project, and you want it to fit your budget. Depending on the use, you’ll have toxicity to think about – what’s the end use of the water? Will it be filtered or pumped as is? Ideally you want to consult at the manufacturer level before you even start, to determine optimum scale and material type, thickness, size and features. Western Environmental Liner for example, has factories and service teams across the United States. We can consult with you for the cost of a phone call, and custom manufacture the liner to fit your project. We can also install the liner for you if needed. Installation is a key part of the process. The bed surface must be free of snags, and the dam must be trenched at the perimeter or otherwise landscaped, so that the liner is married to the bed surface and covered securely at the edges. There must be no movement in any part of the liner, including from wind and sun around the edge. The process is straightforward enough, however, and following established step-by-step instructions, combined with the best materials, will ensure best results.